Good news for people in Southern Finland! On February 3th - DUMB "PAPERWRISTS" record release party, and the next day, on february 4th - BLUE PHANTOMS NETWORK x Need-A-Beat! Dumb's record release party will be held in TÃ¶rstdag Club at Kuudeslinja, Helsinki, and Moonlit Man will also perform live. Free entrance! 23-04. If you still don't have Dumb's album, you can order it from our webstore or get it at the show. We'll bring other stuff for sale as well. 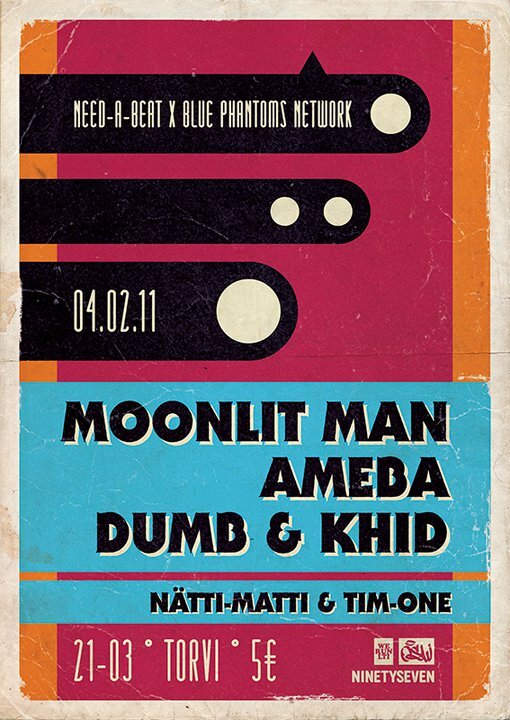 The next day we'll be performing in Lahti, club Need-A-Beat at Torvi, the phantoms line-up this night is Khid, Ameba, Dumb & Moonlit, with Need-A-Beat DJ's NÃ¤tti-Matti & Tim-One. We'll be selling some our music there too. Entrance 5â‚¬, 21-03. Produced by Dumb, Humanlike (aka Neveready) and Yuckah (aka Kaliyuga Pro). Anti-Party Music, APM003. Today's guest was Dumb of whom I wrote about earlier (a few posts down). Dumb performed four songs live and we listened to his upcoming album "Paperwrists" and a lot of other stuff that he is on. I also played a lot of Blue Phantom's stuff from three different albums (of which two are yet to come). Get the Blue Phantoms Network - Chapter 1: The Emerging CD! Chapter 2 is out soon. Oh, I also played a few songs by the Pigeonheads which is me & Dumb, our old project for style-rapping... kinda. All songs were by Finnish artists. Good stuff. Mostly unreleased. 6. Pigeonheads - Who Is You?